As skin ages, collagen production slows. Environmental and other stressors damage the collagen bonds beyond the body's ability to repair them. This damage to the net causes the glycan network to thin and gradually lose its ability to retain water until it collapses on itself. The gel sags, pulling the epidermis with it. The result: dry, thin, wrinkled, sagging skin. Nutrients can no longer easily pass through the collapsed glycan network from the dermis to the epidermis. Skin healing slows and is eventually incomplete. Skin tone becomes blotchy and uneven. In tests, scientists at Ultra Aesthetics Labs, found that PP-4 stimulated collagen IV synthesis by 30 to 117% and Hyaluronic acid synthesis by 267%. Next they used image analysis to determine the affect PP-4 had on wrinkled skin after six months of daily application. The six-month results are listed below, though they noted that significant results were seen in two months. Matrixyl 3000 is an anti-aging skin treatment that promotes collagen production while stimulating fibroblast cells (the cells that in the skin that manufacture collagen), enabling them to significantly reduce the appearance of wrinkles. Matrixyl 3000 is a combination of two peptides, Palmitoyl Pentapeptide -4 (PP4) and Palmitoyl Tetrapeptide-7 (PT7). Matrixyl 3000® promotes collagen production while stimulating fibroblast cells in the skin, enabling them to significantly reduce the appearance of wrinkles. 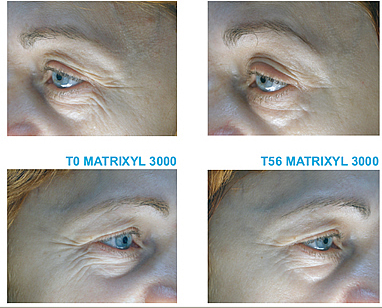 The pictures above shows the effect of the application of a cream with 3% Matrixyl 3000 concentration. Our moisturiser contains a 5% concentration. 5% is at the top end at the manufacturers recommended usage rate The active ingredients are held in our own formula moisturising cream that is free of harsh man-made chemicals, artificial preservatives, fragrances, and colourings. The base cream includes botanical oils that are exceptionally moisturising, contain high levels of Vitamin D and E, and also include high levels of Gamma-Linolenic Acid (GLA) - a vital component in skin regeneration, with its ability to soothe skin, promote healing and regulate water loss. Imagine - that's just the base cream. A chemical free, nutrient rich, deeply moisturising cream that will benefit your skin even before the active ingredients get to work. Vitamin E, a powerful anti-oxidant which targets damaging free radicals and renders them ineffective. It is free radical activity in our skin that is probably the biggest single cause of aging. Antioxidants protect skin by neutralizing free radicals, which would otherwise destroy skin and its components. These free radicals are stimulated by ultraviolet light and also occur naturally in the oxygen atmosphere. 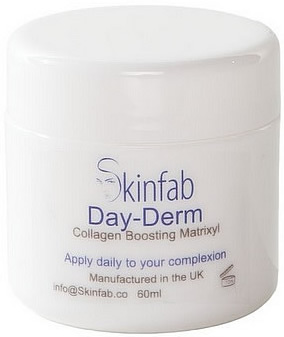 Most experts agree that the action of free radicals is the single biggest contributor to premature ageing of the skin. Collagen booster for anti ageing. How Palmitoyl Pentapeptide-4 Works in Skin Care Products - Palmitoyl Pentapeptide-4 (PP-4) is a synthesized version of a protein found in the most common type of collagen. PP-4 stimulates the skin to produce collagen, elastin and hyaluronic acid which are key components of the extra-cellular matrix (the mesh that holds and supports the skin cells). In young skin, collagen fibres are bound together by elastin in a well-ordered network. The holes of the collagen net are filled with a water-saturated gel, the glycan network. This water-soaked net gives the skin its elasticity. Hyaluronic acid is a key glycan which can hold up to a thousand times its weight in water. Panthenol: soothes, softens and moisturizes the skin, reducing the appearance of fine lines and wrinkles. Its exfoliating properties fight free radicals and promote new skin cells to consistently regenerate, offering a more youthful, fresh appearance. Glycation is the process by which glucose links with proteins and causes them to bind together, Glycation affects the skin's support system-collagen, elastin and other proteins-and leads to wrinkles, sagging, loss of youthful contours and uneven skin tone. PT-7 works by suppressing the production of interleukins in the skin which are a precursor to the process of glycation. Directions: Apply a small amount to the fingers and apply to face massaging gently into the skin. Use daily. The Day cream absorbs quickly allowing you to apply make-up if you wish. Legal Disclaimer: Please Note this product contains oils derived from nuts - if you have a nut allergy or intolerance to nuts please do not use this cream. Even though all our products are safe, we advise you to patch test for 24hours before the full use of any beauty product. Consult your doctor if for any reason you have a skin condition before the use of any skin product.